The Huntington Police Department places a high value on integrity and public trust. This office safeguards the level of trust and confidence the public has in its police department and ensures our agency remains deserving of that trust. We also ensure that the rights of our employees are protected and all persons involved in an inquiry are treated with dignity and respect. The office is also responsible for departmental inspections, maintenance of personnel files, policy and procedure review, and facilitation of the CALEA accreditation process. The Huntington Police Department has more than 100 policies and procedures to follow as detailed in the HPD Policy and Procedure Manual. The Huntington Police Department makes every effort to investigate and adjudicate all complaints in the most expedient time frame as possible. However, there are circumstances, such as case complexity and/or witness unavailability, which can delay the process. There are five ways an allegation can be adjudicated—sustained, not sustained, unfounded, exonerated and withdrawn. The goal of the department is to apply progressive disciplinary action to ensure misconduct will not recur. Disciplinary action can range from counseling to employee termination. In some cases employees may also receive additional training in the subject areas where violations have occurred. Police officers are trained to seek voluntary compliance in their lawful direction, however, they are sometimes met with circumstances in which a subject’s actions compel them to use force in order to gain compliance or defend themselves or others against serious injury or death. Supervisors are required to complete a “Use of Force Report” any time force is used resulting in injury or complaint of injury to a suspect. 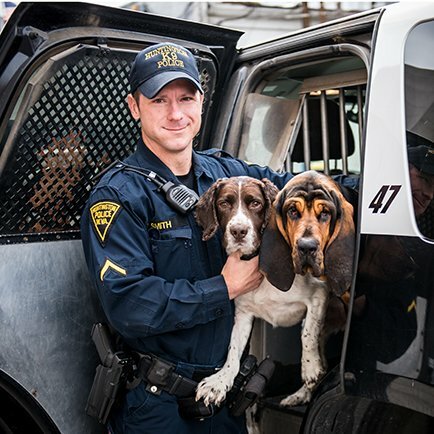 In order to provide police services throughout the 17 square miles of the city of Huntington, Huntington Police Department employees drive a significant number of miles in HPD vehicles. Officers drive their vehicles in all types of weather, traffic and emergency conditions, day and night. The Huntington Police Department investigates all traffic crashes and operational damage incidents occurring to police vehicles. Each quarter, the Office of Professional Standards convenes an Accident Review Board to conduct a fair and complete review of the accidents to determine if the accident was preventable or non-preventable. Progressive disciplinary action is administered to all employees involved in preventable accidents. Discipline ranged from oral reprimand to suspension without pay. CALEA, or The Commission on Accreditation for Law Enforcement Agencies, is a credentialing program for law enforcement agencies. Accreditation through CALEA involves not only updating and revising policies and procedures to implement the current best practices, but also a system of review to ensure that the policies are actually followed in practice and not just on paper. The process of accreditation is quite lengthy and involved and can take years to accomplish in some cases. The Huntington Police Department is approximately 55% finished with our policy updates and revisions. Once our entire policy and procedure has been revised to meet CALEA standards, we will then begin the review process by the CALEA commission to seek accreditation. Having trained our employees in 2012 in the use of Blue Team action response reporting software, the Office of Professional Standards is now in the process of implementing the use and application of IA Pro. This program works in conjunction with the Blue Team software to track complaints, use of force, firearms discharges, and vehicle crashes. It also incorporates an “early warning” function that helps identify personnel that may need intervention or remedial training in certain areas. This will allow the department to be proactive in training and personnel management, and take action before these issues may become problems. Currently we are in the application phase of the process. Our goal for 2011 is to make significant advances in the four-part process of accreditation. In September 2010, we began the process of reviewing all departmental personnel files. A yearly review is now available for all employees. This will allow for an update in the areas of commendations, training and disciplinary actions. As this review progresses throughout 2011, our goal is to convert our personnel files to electronic format.